Dog lovers are extra lucky to live in Los Angeles, we think. After all, there's something major and mutt-y happening just about every weekend -- Nuts for Mutts, adoption fairs, parades teeming with tutu-sporting waggers -- not to mention a bevy of very involved rescue groups. Of course, rescue groups flourish everywhere, which is a very good thing, but LA has some of the most active. For example, Little Angels, which focuses on those kings and queens of piggy-tailed goodness, the Pug. We've attended and liked past PugFests organized by the group -- loved the tiny, panting Elvis in the wee pink Cadillac -- and we like that the organization raises money for rescue in other ways, like this charming poster by artist Christine Head. 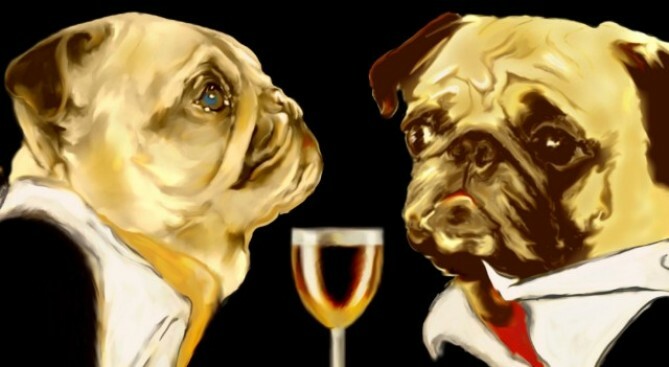 It's sophisticated, it is old-fashioned, it boasts two debonair pugs in formal wear. Plus a goodly amount of funds raised via the poster helps Puglets in need. It is a Pug kind of town, after all. Feels like every ninth movie features a little foldy-faced beastie -- hello, "Men in Black" -- and it is common knowledge that the compact canine makes an ideal companion in the city. Stroll any quaint neighborhood and you're bound to see one of the tiny goblins of the dog world huffing along. Detail of the poster above; view the entire work, and find ordering info, here.